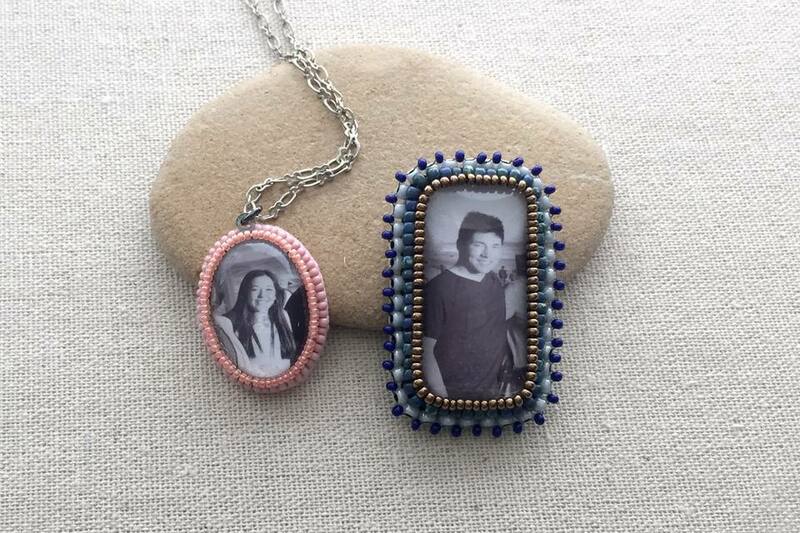 Have you ever found an antique locket or picture pendant and thought about how special those pictures were to the wearer? Portraits and pictures were less commonly available than they are today and holding a loved one's likeness close was a special way to keep in touch–in the days before cell phones and facebook. Even in today's ultra connected life, wearing or displaying pictures of loved ones is a sentimental gesture that isn't overrated. Bead embroidery techniques are often used to surround glass and gemstone cabochons or to add decorative accents to for jewelry, clothing, and accessories. This project uses a picture as the centerpiece to make a timeless collectible. It is easy to alter the look of this project from old style antique to modern masterpiece based on whether you choose to use a black and white or color picture. The picture cabochon is a glass dome with the picture glued to the flat side. For the pendant in this project, the cabochon is also enclosed in a metal bezel frame. This is optional, but it does protect the picture from moisture a little more than without it. Sets of glass domes and bezel frames are widely available in the jewelry aisles of craft stores. Print your picture and adjust the size and exposure so it will fit in your glass cabochon. A nice feature of domed cabochons is that they will magnify your picture slightly! Once you have found the right placement, mark the photo on the top and bottom. Apply Mod Podge or similar clear sealing glue and press the glass cabochon to the picture. Make sure there are no gaps and allow the adhesive to dry thoroughly. Use the same technique to adhere the photo cabochon to the bezel pendant setting if you are using one. Let dry. For this bezel frame, I bent the hanging loop out of the way to easily bead around it. If your bezel does not allow this, you will just need to stitch to the side of the bezel and continue beading on the other side. The best part of this project is that bead embroidery is easy. If you can sew a button, stitch a hem or thread a needle, chances are you can learn bead embroidery. Like all crafts, there are some supplies and basic terminology–but this project minimizes those so you can learn the basics and have great results. The materials you will need are a bead embroidery foundation such as stiff felt, flexible glue like E6000 or rubber cement, bead thread, such as FireLine or Nymo, and seed beads. Regardless of the size and style of your picture cabochon, you will use two sizes of seed beads. The first outer layer of beads will be larger beads and the inner layer will be smaller. For the necklace pendant pictured ( 3/4 inch wide and 1 inch high), size 11 beads are used for the outer frame and size 15 beads are used for the inner frame. Round seed beads work better than other types of seed beads. For a larger frame, like the rectangle in the first photo, size 8 beads are used for the base round and size 11 beads for the inside edge. Glue the photo pendant to the bead embroidery foundation using the flexible glue and allow it to dry. Thread an arm's length of beading thread onto a beading needle, a size 11 needle works well for this. For best results, use a thread color that matches the bead foundation. To add the first round of beads, you will use a common bead embroidery technique called back stitch. Insert the needle through the back of the foundation material as close to the cabochon as possible. Make sure the needle is straight up and down. Leave an eight inch tail on the back side. Pick up four beads, slide them down to the cabochon and stitch down into the foundation in front of the fourth bead. Leave a space of two beads length and insert your needle back up through the foundation. Pick up two beads and stitch back through the four beads you previously added. Pick up four more beads and stitch down through the foundation. Count back six beads and bring the needle back up between the beads. Always keep the needle as close to the edge of the cabochon as possible. Put the needle back through the six beads you previously stitched. Continue beaded back stitch by picking up four beads each stitch and going back six beads. Do this until you are all the way around. For the last stitch of the round, only pick up as many beads as you need in order to complete the round. Bring your needle up between the beads to finish the last stitch, then put your needle through all of the beads in the round, pulling taut but not so tight that the beads lift from the foundation over the edge of the cabochon. Go through the beads at least 2 or more times. The goal is to fill the holes in the beads and straighten out the beads. Put your needle back through the foundation near the tail end. Tie the threads together using a square knot and weave the thread ends back into the beads. The second round of back stitch is used to secure the cabochon in place. You will use the same back stitch, but instead of picking up four beads and stitching back through six, you will pick up two beads and stitch through four beads. This round of beads will rest on top of the first round, covering the edge of the bezel or just the curve of the cabochon if you are not using a bezel frame. To start, insert the needle as close to the cabochon edge as possible between the cabochon and the bead row you just finished. Leave an eight inch tail. Pick up four size-15 beads and stitch back down into the foundation between the first row of beads and the cabochon edge. Leaving a two-bead space, come back up through the foundation, pick up two beads, stitch through the four beads you already added and pick up four more beads. Stitch down into the foundation and come back up between the second and third bead you just added. Stitch through the two beads, pick up four more beads and stitch through the foundation. Come back up through the foundation two beads back–and continue by picking up four beads, stitching back two, etc. Continue stitching, adding only as many beads in the last stitch as you need to finish the round. Add the last beads and then stitch back through all of the beads at least two times–pull snug so the beads straighten out and the holes are filled. Put your needle through the foundation close to the tail thread so you can tie it off with a square knot. Weave in the tail ends. Trim the foundation material close to the edge of the cabochon. Be sure not to cut through the stitches. As long as you have kept your stitches close to the edge of the cabochon, you can trim to the bead edge without cutting any threads. Add a jump ring to hang the pendant. If desired, you can add more back stitch rows around the outer edge. The rectangle frame pictured has an additional layer of fabric on the back to protect the stitches that are attached by adding brick stitch edging with a picot. A picot simply adds one more bead to the edge stitches. Your finished picture pendant makes a wonderful gift for a loved one!